The 4L Micro Drink Bowl is designed with JFC’s unique double wall for extra strength and durability. 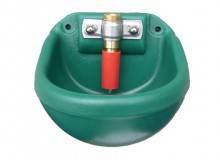 The Micro Drink Bowl is fitted with a float valve, Polycarbonate protection cover and a drain off plug (50mm). The 2L Nose-Fill Drink Bowl is designed with JFC’s unique double wall for extra strength and durability. The nose fill valve dispenses water on demand ensuring fresh water is always available. Water supply piping suitable for wall fixing.